Edelbrock and AFB carburetors will require spacer 555-50071 for adequate clearance of the barb fitting and/or electric choke. 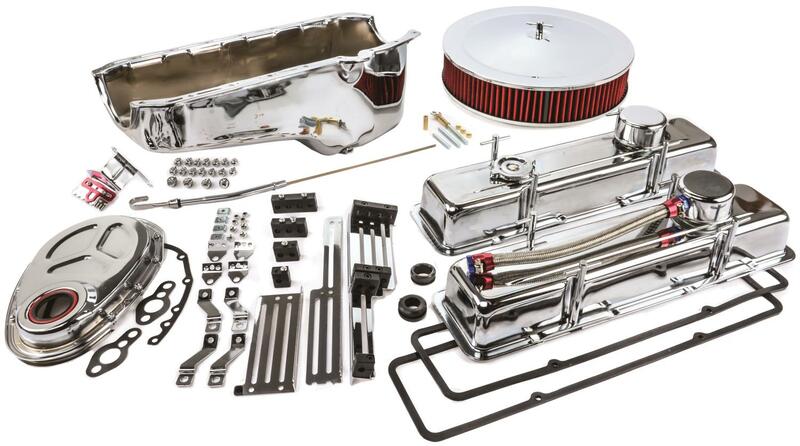 JEGS "Deluxe" Small Block Chevy Chrome Engine Kit includes many of the items needed for 1955-1979 Small Block Chevy(with drivers side dipstick) installations. Includes chrome valve covers (short), PCV breather, standard breather, oil fill cap, t-bar hold downs, 14"x3" air cleaner, oil pan, oil pan bolts, dipstick and tube, timing chain cover kit, adjustable timing tab and locking header bolt kit. Also includes two grommets, valve cover gaskets, air cleaner stud and wing nut and linear wire dividers. Requires use of oil pan/front cover gasket (1975-79 design) with a thick front seal (sold separately). 50531 - JEGS Deluxe Small Block Chevy Chrome Engine Kit is rated 4.6 out of 5 by 7. Rated 5 out of 5 by Blueberry from Exceptional quality for the price A lot nicer & more complete than I ever expected..... Shipping / transaction & all were hassle free & before or on time exact...!!!!! Rated 4 out of 5 by Monkey from Complete, easy kit Great kit with everything I needed to finish a build. The kit did have one flaw: one of the valve cover hold-downs came with stripped threads. No, this is only made for the small block Chevy engine. Will this fit a 1984 el camino 350 sbc. No, many of the kit components will work, but not all of them. Yes, in a pre 1979 El Camino. will this fit a 1962 buick skylark? No, this would only work if you have a small block Chevy engine in your Buick. Will these clear a 3.75 stroke crank with 6in rods? That pan shows a max stroke of 3.50 so the 3.75 stroke crank will not work. I have a 1977 amc 360 motor and ive looked everywhere for a nice dress up kit for it and cant seem to find it. will this for or does anyone know where i could find one for an amc 360?